Have been staying at Wayne and Scarlet’s for a few days sorting stuff, loading sledges etc. Every one up here knows about the expedition. Most of the Quest runners are now following us. All the kids are following us and doing projects around the trip! Set off from Wayne and Scarlet’s cabin around 10.00am to sledge 27 miles up the Yukon. Easy sledging, though a lot of open water on the river. Slept the night on the floor of a self-built cabin. Had some technical issues with the equipment but Pat Oakley in Canada – our technical base – has been fantastic with support, we now should be on the map! Left around 10am to sledge 33 miles to ’40 Mile’ village. The river Yukon is much faster running than I thought it would be, there is a lot of open water on the river and some nasty slush ice overflow. Smashed my knee on some ice when I caught an inside edge on an ice crack and the sledge flipped. Saw two herds of Caribou, one running across in front of the dogs. Arrived at Earl’s cabin late in the day. Left 40 Mile village at 10am and sledged 20 miles uphill to approx. 3800’ at the top of the “World Highway”. The trail was blown out in places and we had a very interesting traverse with a drop off to manoeuvre where we turned the sledges three times! Sledged on until dark, then stopped on the trail around 7pm to feed the dogs, using the Primus stoves to melt the snow for their food. We then lay down by our sledges to sleep for 4 hours, but there was a strong wind so we got going after 2 hours and sledged all night to Dawson arriving at 4.00am. Total distance was 68 miles. 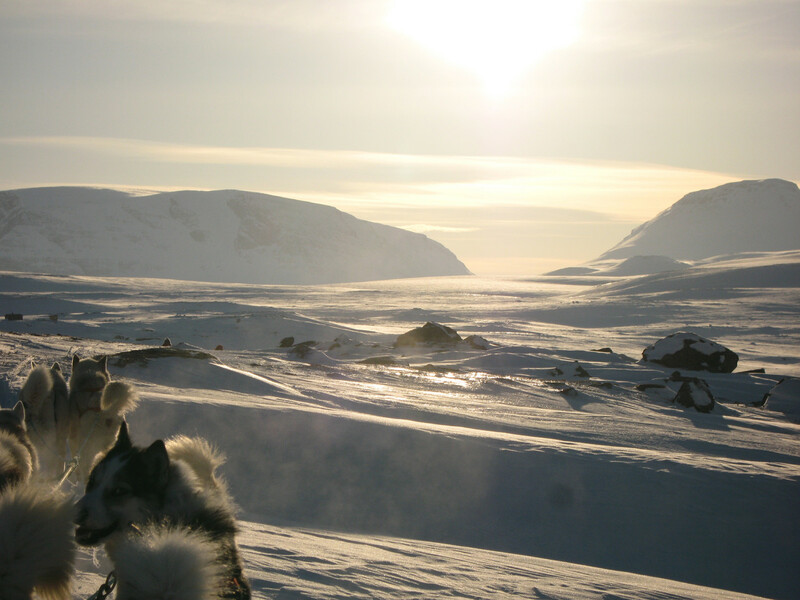 We put the dogs out on pickets and slept for a few hours on the sledges. Brian Wilmshurst, who will be trucking us to Inuvik in the Northern Territories, arrived at 7.15am and we fed the dogs, drove into town and had a good breakfast as we hadn’t eaten since Tues morning! Staying at Brian’s place tonight. The Dempster highway to Inuvik has been closed for three days at Eagle Flats due to snow drifts and gales. We are a day ahead of schedule so it will hopefully reopen tomorrow. Plan is to head off and if it’s still closed we can sleep in the truck tomorrow night and hopefully get to Inuvik on Friday morning at worst. Aussies in the Strahorn clan following as well! Hope your knee is OK. I'm sitting on my couch in my Wiltshire home watching your track head out across the frozen Barents Sea at 1:30 pm Inuvik time. Accuweather tells me the easterly wind in your faces is -21C. It feels like -30C on this is partly sunny day and the sun sets at 7pm - perhaps earlier as you move up the Firth delta. Visibility is +20km but you are a very long way from anywhere. For all the tech and data I can't imagine how you all feel right now! I just hope the GoPros are running! Sieze the day And camp safely IAF Team! My cat has just pointed out that you are on the edge of the Beaufort Sea! Cool cat! Tristan wants to know if you stay up all night running the dogs and sleep during the day? Marlys wants to know if you are wearing any fur clothing? Josh wants to know if you have a seat on your dog sled that you sleep in while mushing? Shian wants to tell you that she learned about the ermine and its black tip on its tail. It is to make the predators go after the black tip and miss their body so they can get away. Kirsten is learning about Inuit dogs and they can eat anything you give them. What do you feed your dogs? Ian wants to know if you have any dried salmon, caribou or moose with you. Sharon wants to know who is breaking trail? Are you taking turns with snowshoes, skis or is there someone along with a snowmobile? Hi Eagle Community School, Mr Oakley is not able to look at these questions. You will be able to ask him in person before he has a chance to see them.